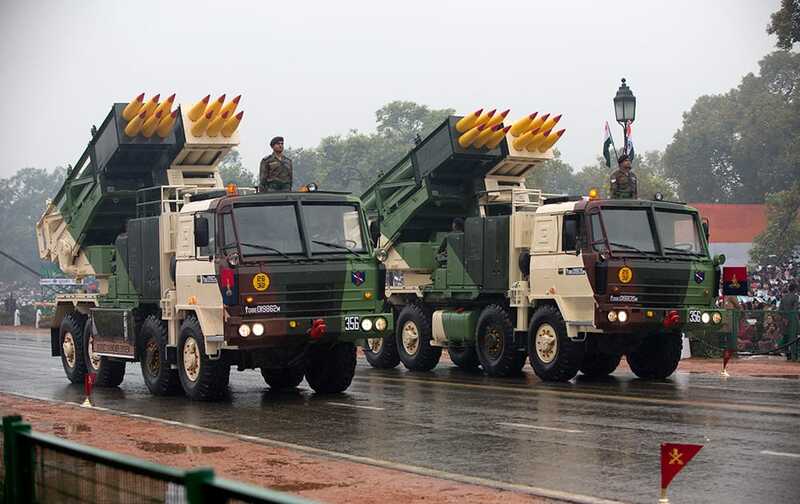 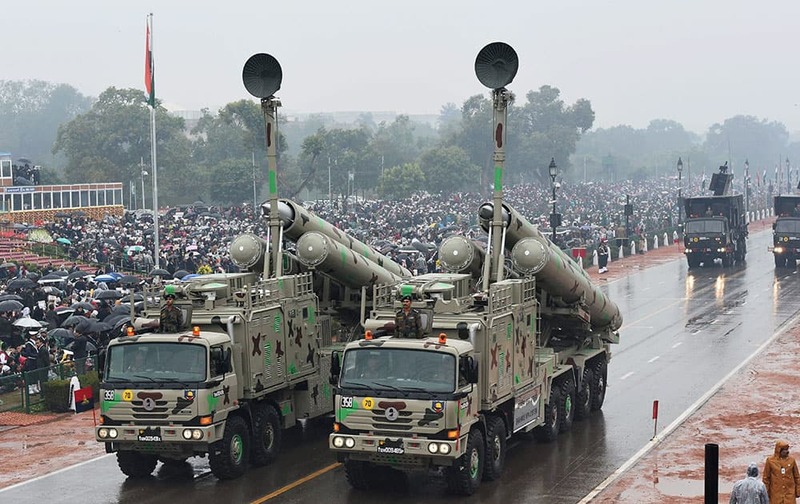 Brahmos Weapon System on display during the 66th Republic Day Celebration at Rajpath in New Delhi. 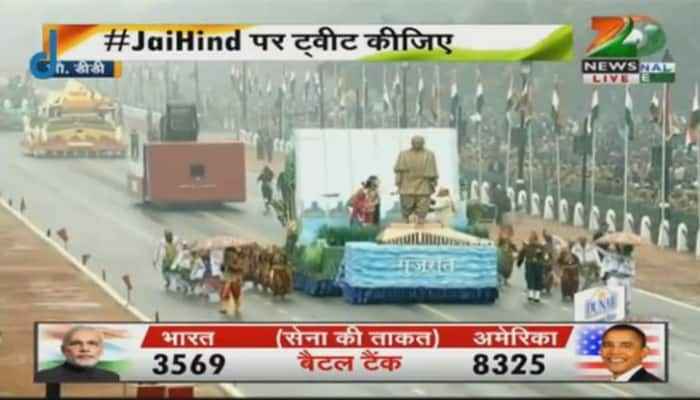 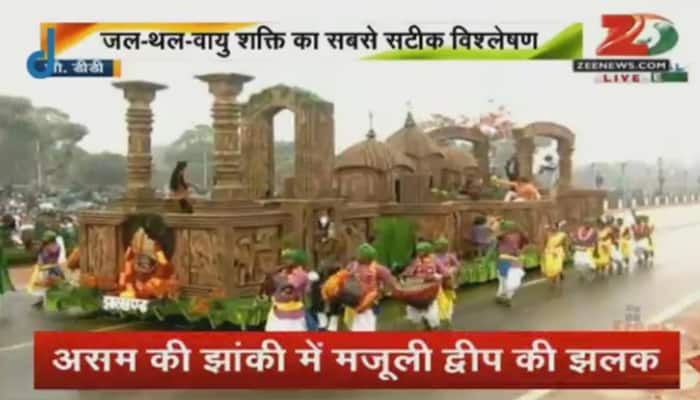 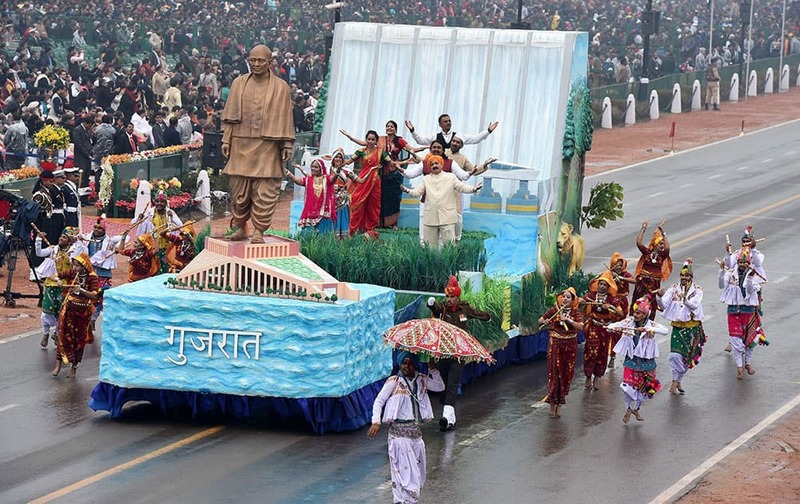 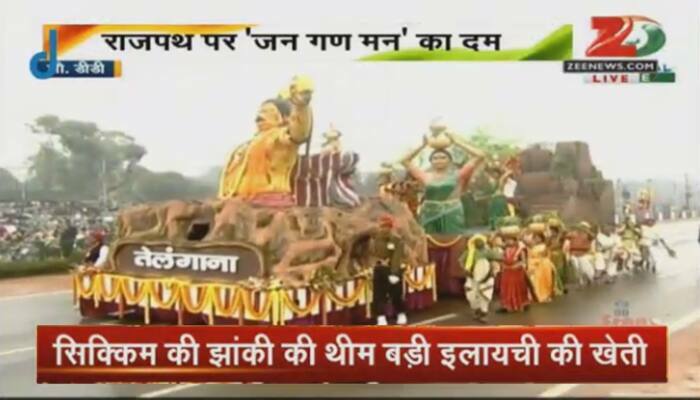 Gujarat tableau on display during the 66th Republic Day parade at Rajpath in New Delhi. 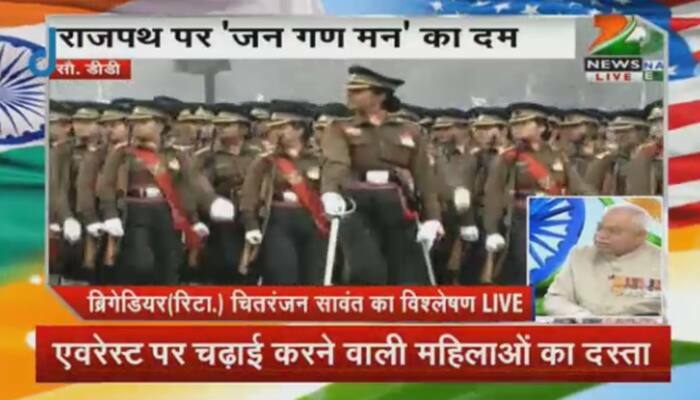 Navys women contingent marches during the 66th Republic Day Celebration at Rajpath in New Delhi. 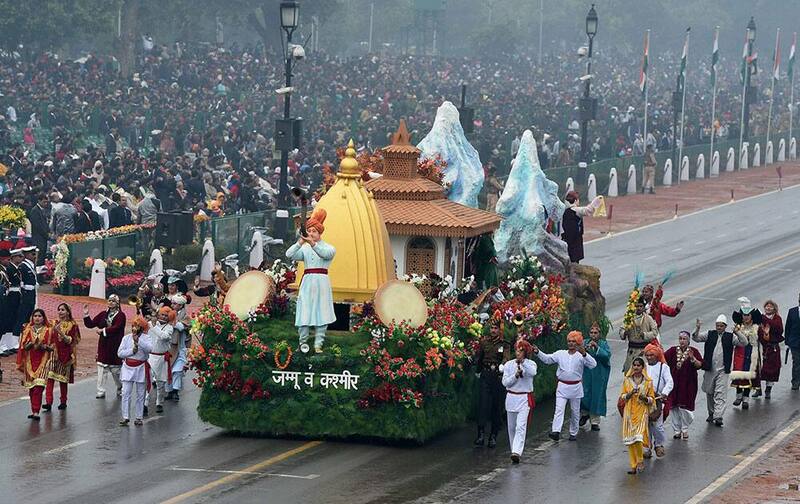 J & K tableau on display during the 66th Republic Day parade at Rajpath in New Delhi. 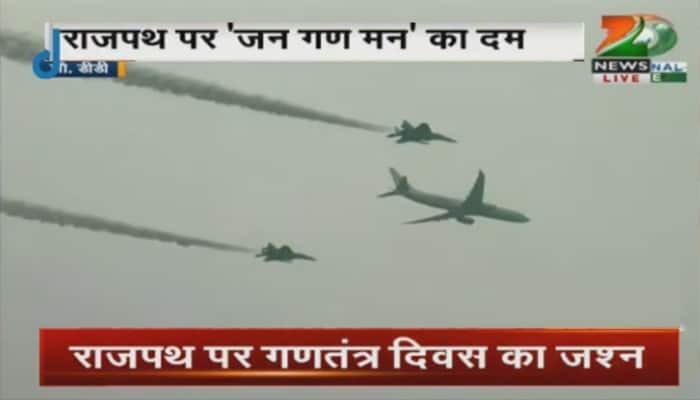 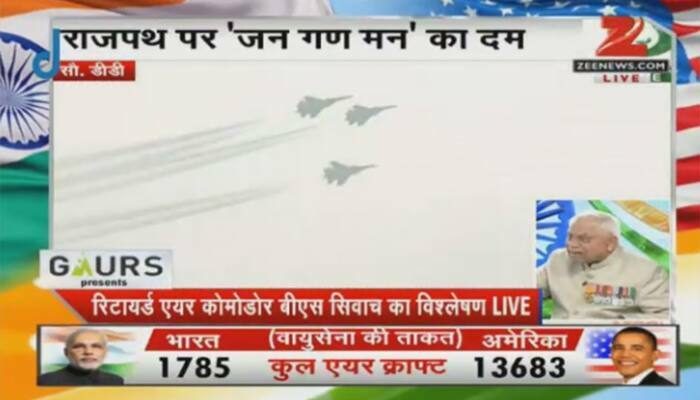 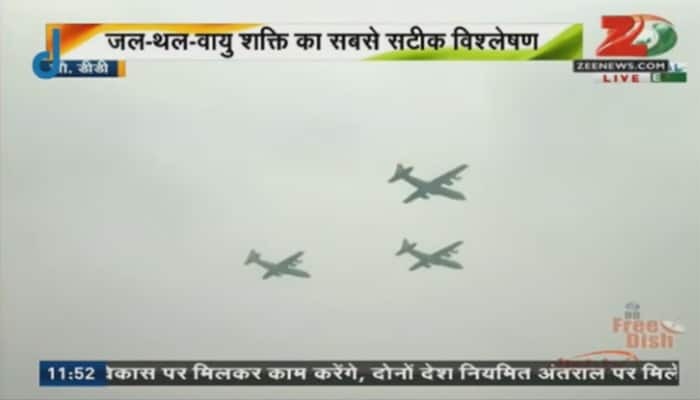 Fighter planes flying past during the 66th Republic Day parade at Rajpath in New Delhi. 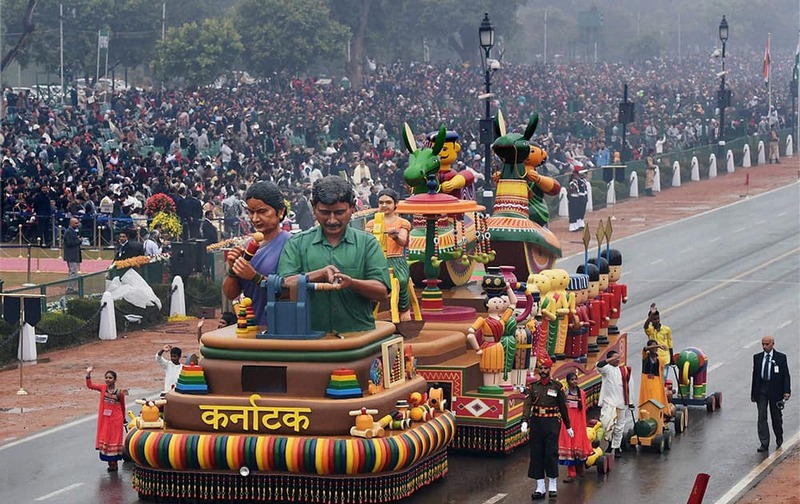 Karnataka tableau on display during the 66th Republic Day parade at Rajpath in New Delhi. 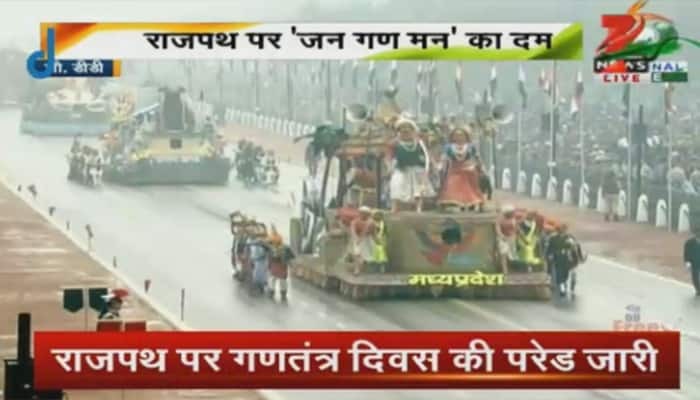 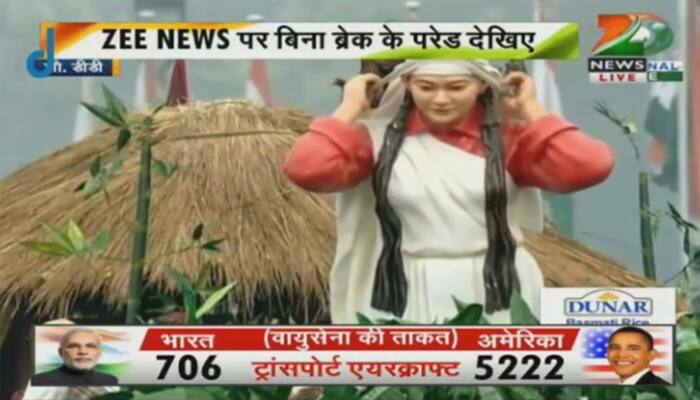 Andhra Pradesh tableau on display during the 66th Republic Day parade at Rajpath in New Delhi. 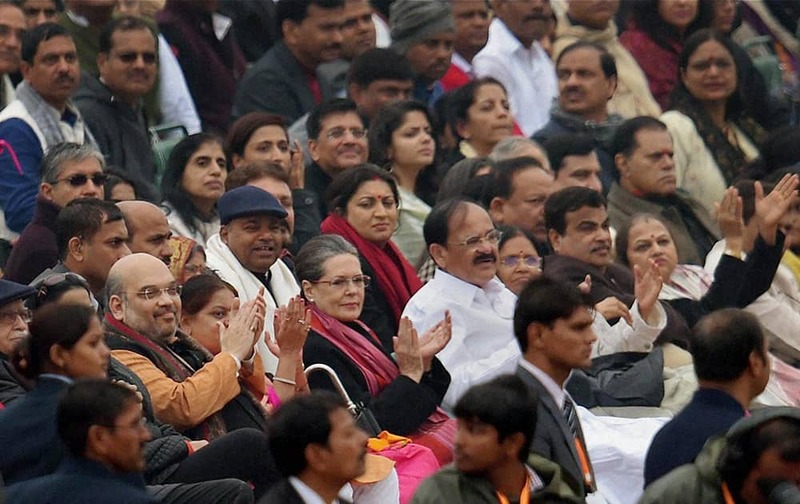 BJP President Amit Shah, Congress President Sonia Gandhi, Union ministers M Venkaiah Naidu, Nitin Gadkari, Harsh Vardhan and others during the 66th Republic Day parade at Rajpath in New Delhi. 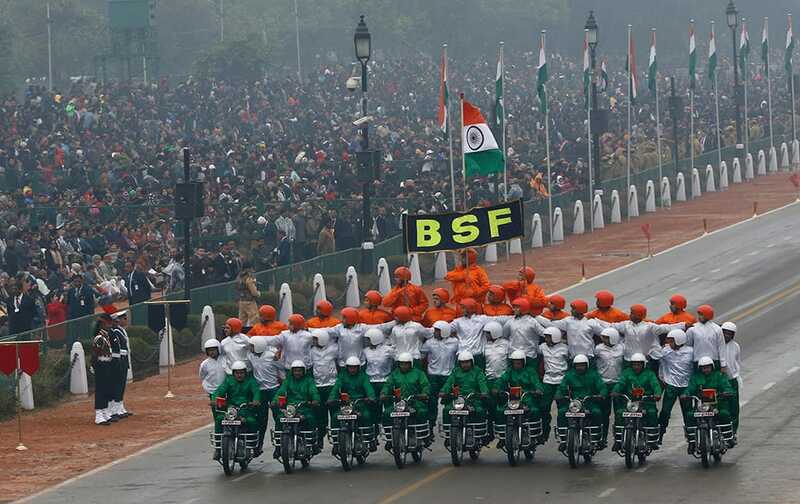 Border Security Force soldiers perform a motorcycle stunt during Republic Day parade in New Delhi. 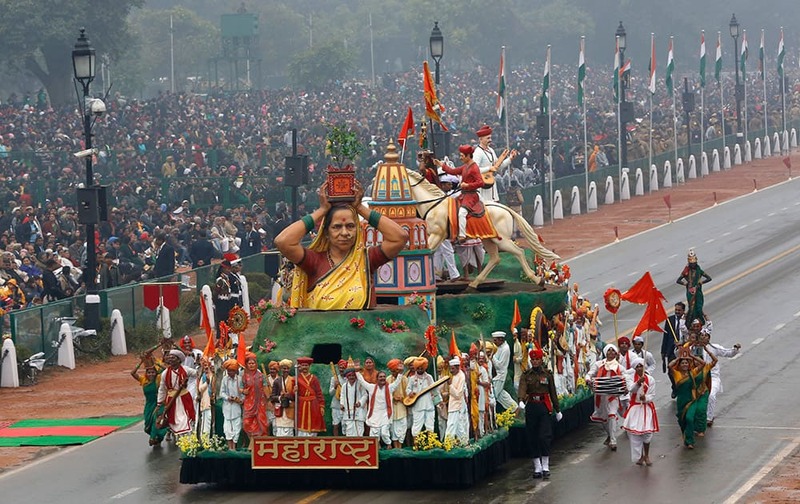 The tableau representing Maharashtra state moves past during the Republic Day parade in New Delhi. 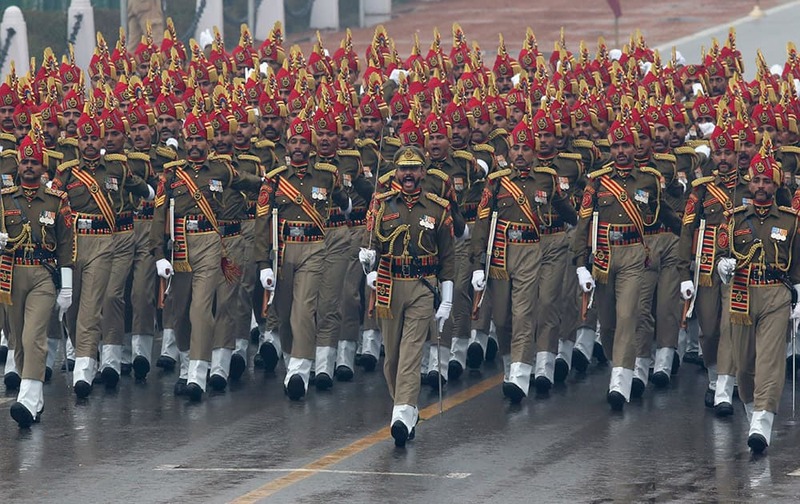 Paramilitary soldiers march during Republic Day parade in New Delhi. 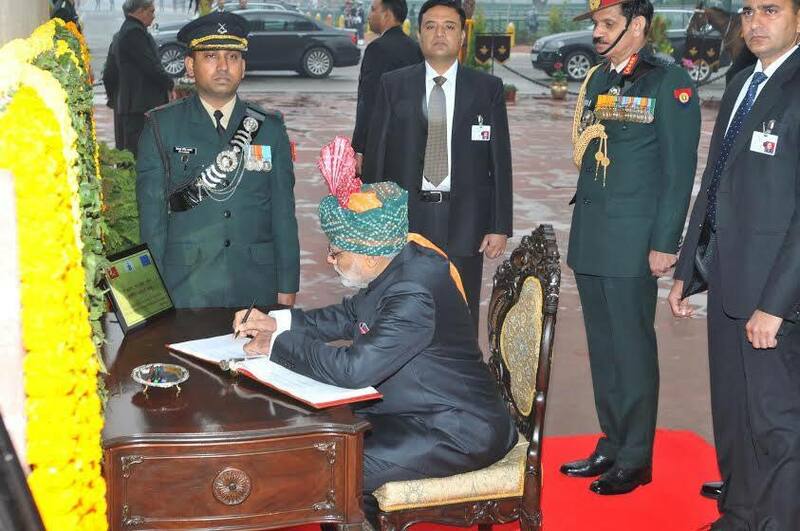 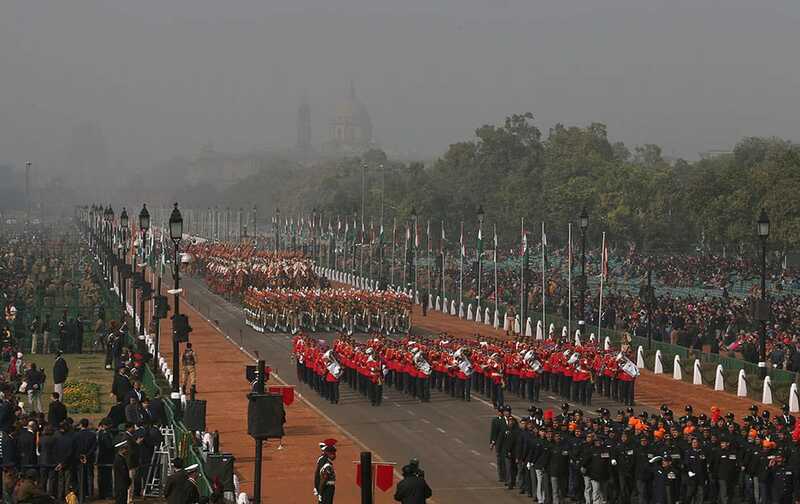 Republic Day marks the anniversary of India's democratic constitution taking force in 1950. 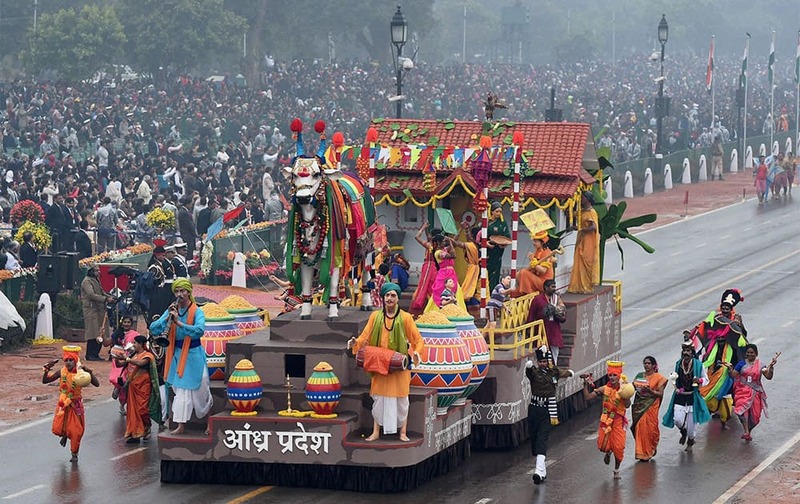 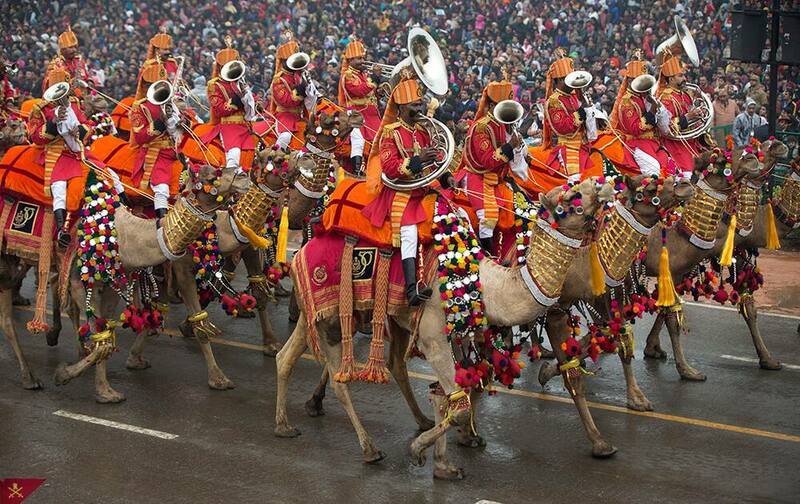 Beyond the show of military power, the parade includes ornate floats highlighting India’s cultural diversity. 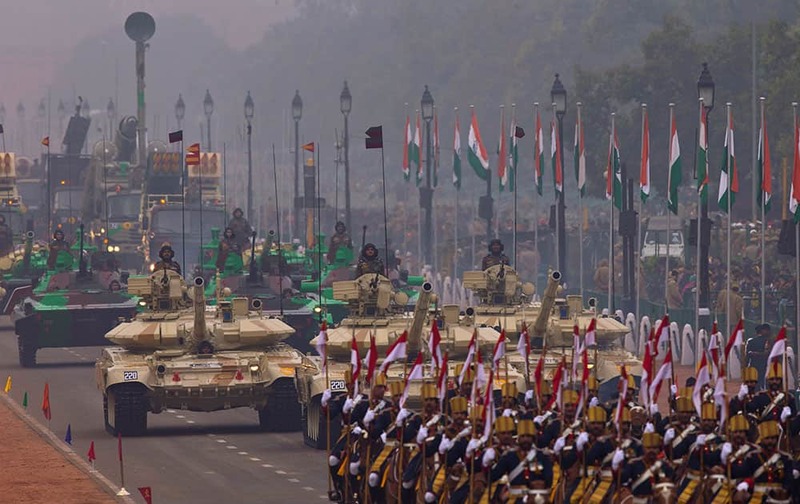 Military weapons move along the Republic Day Parade route in New Delhi. 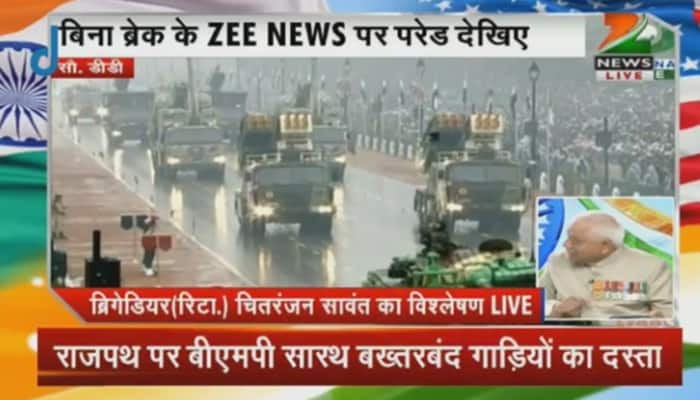 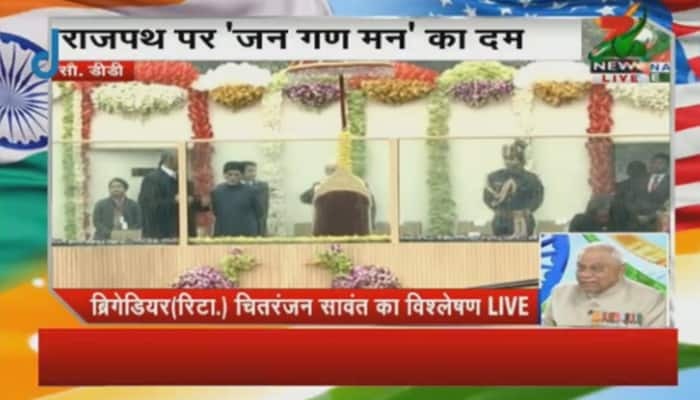 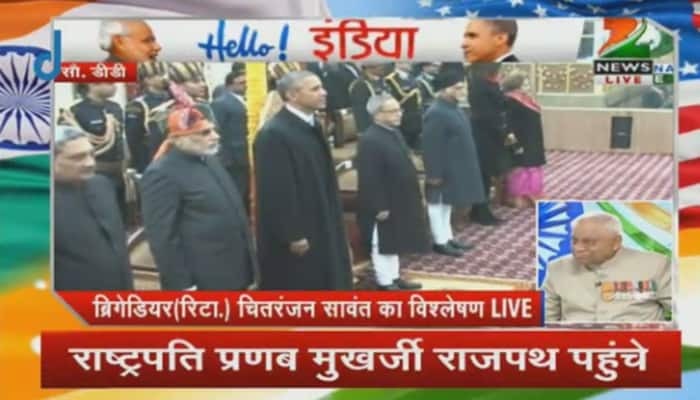 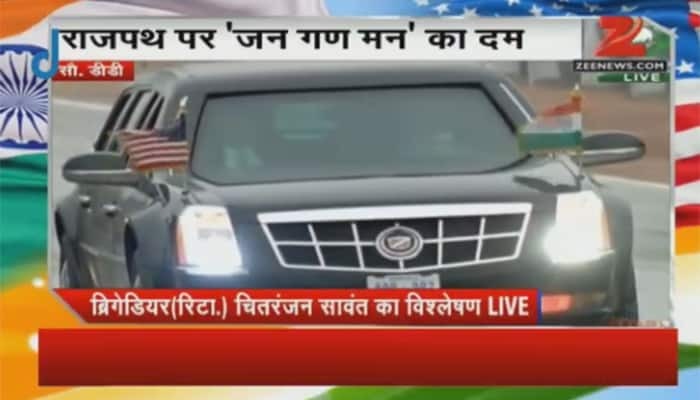 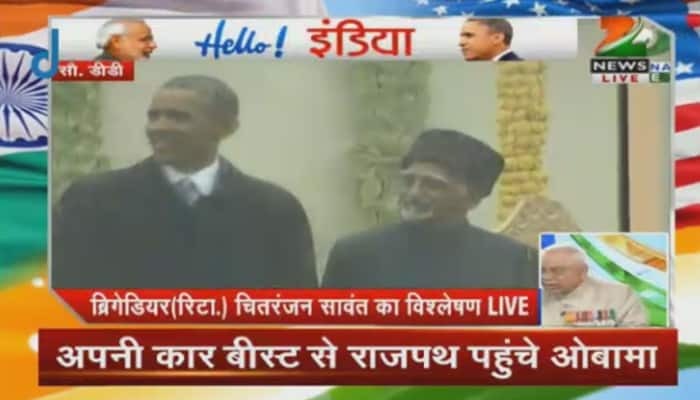 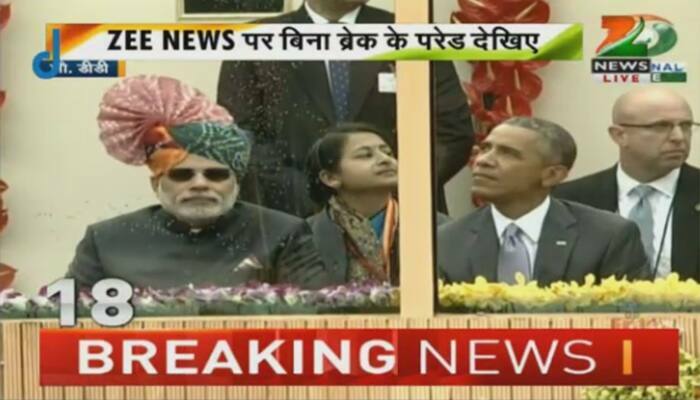 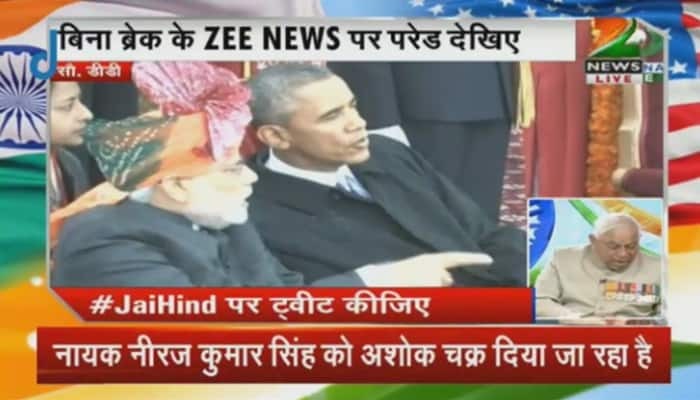 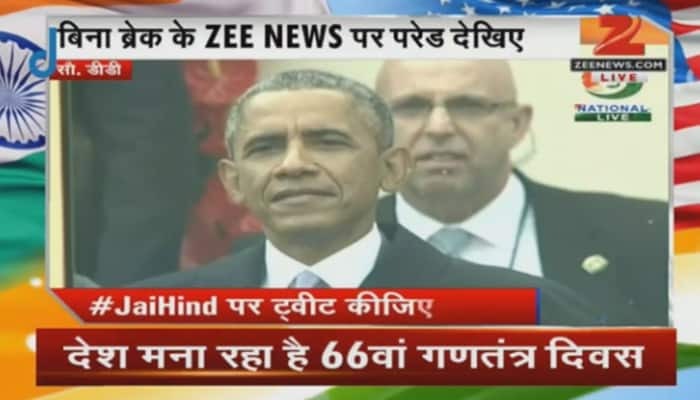 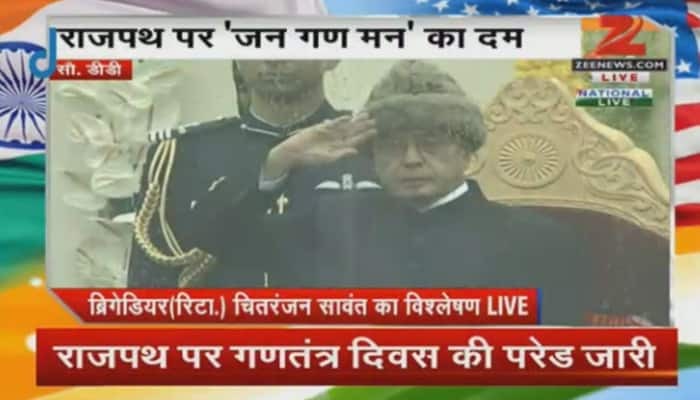 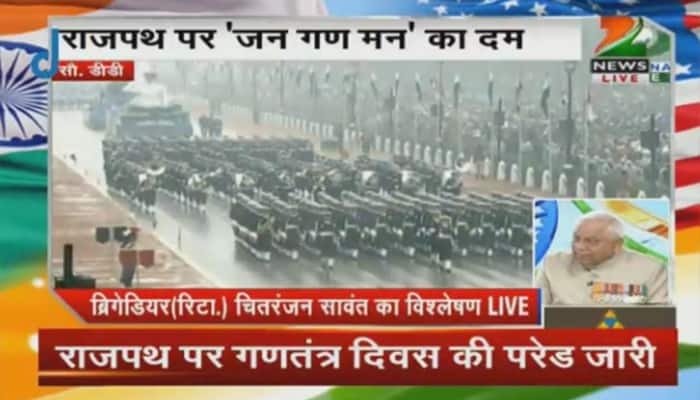 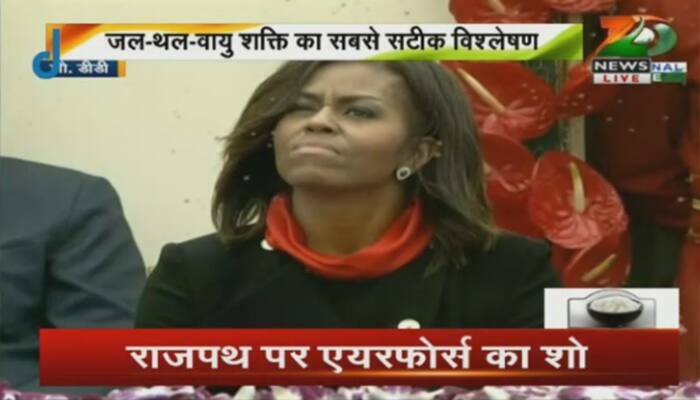 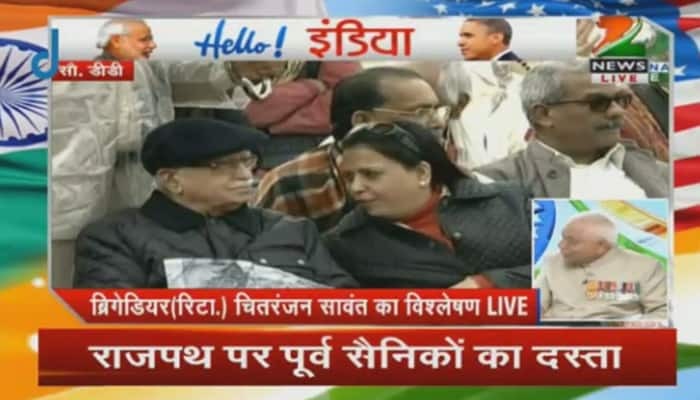 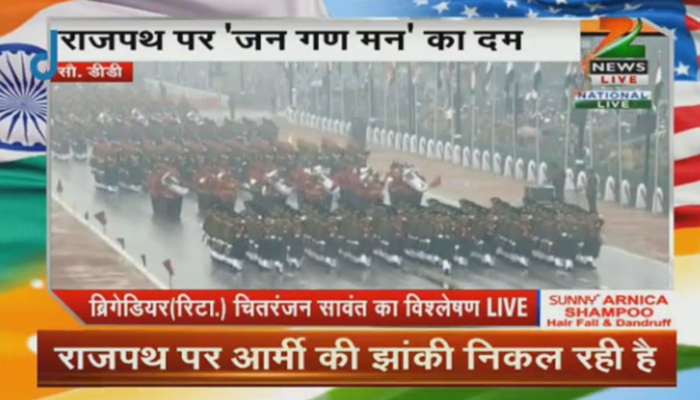 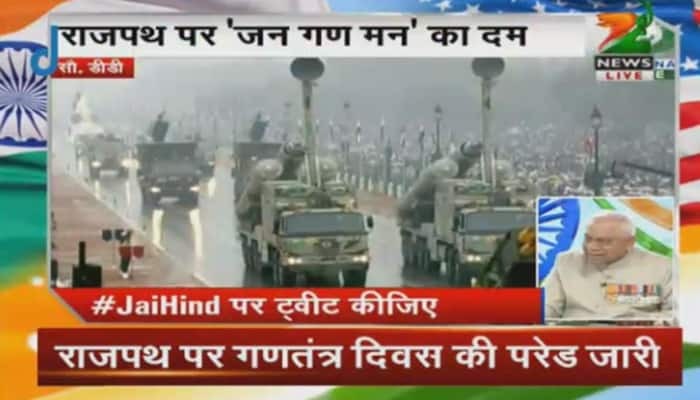 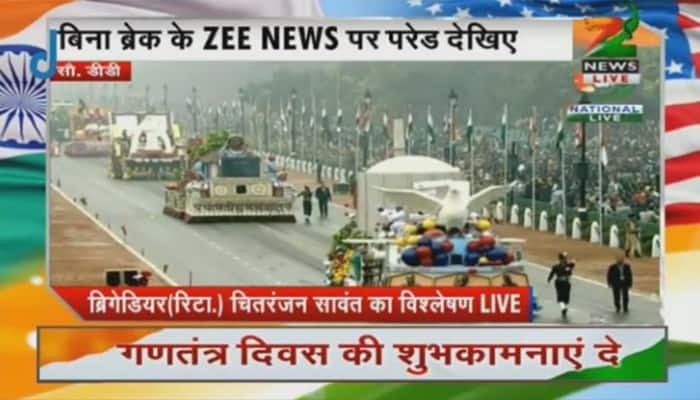 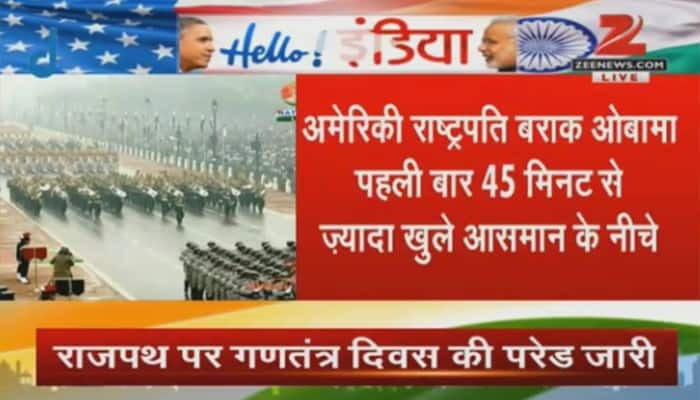 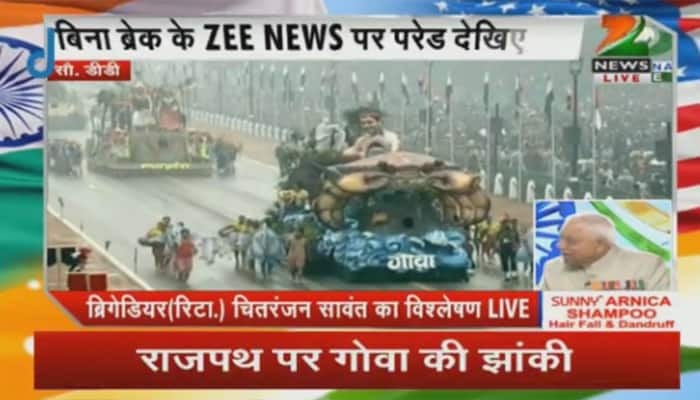 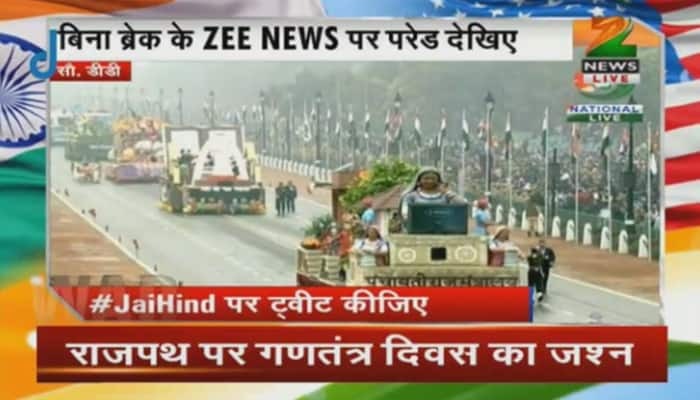 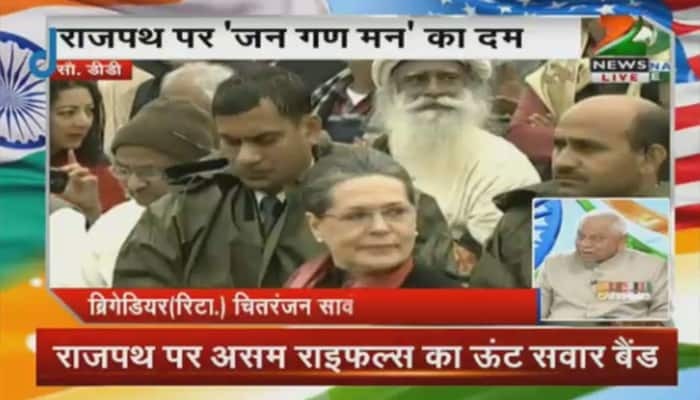 President Barack Obama is the Chief Guest for this year's parade. 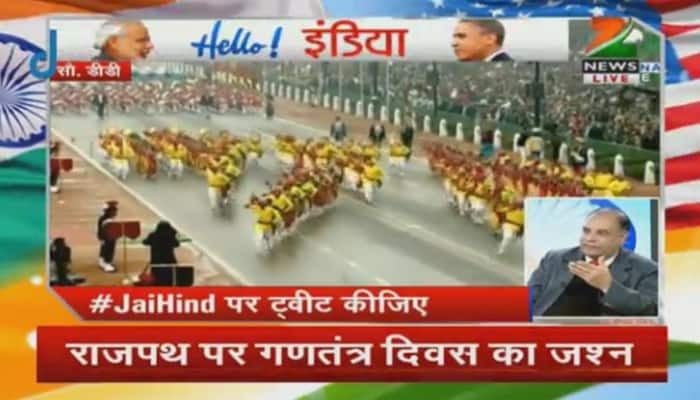 President Barack Obama is the Chief Guest for this year's parade. 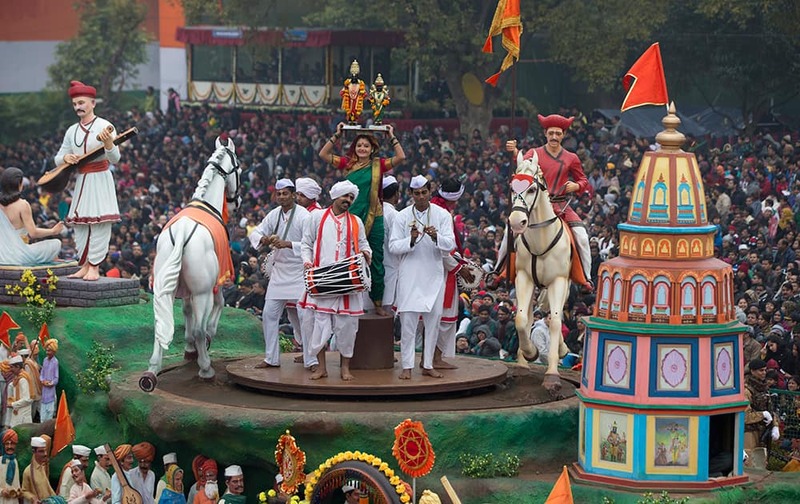 Performers spin around atop a float during the Republic Day Parade in New Delhi. 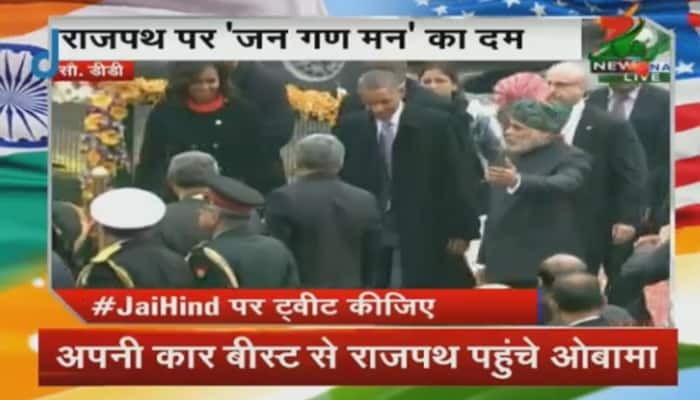 President Barack Obama is the Chief Guest for this year's parade. 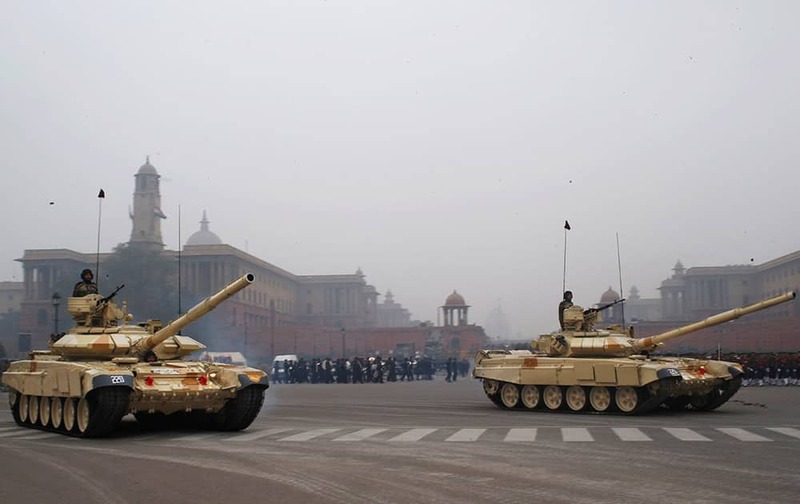 Tanks move along the Republic Day Parade route in New Delhi. 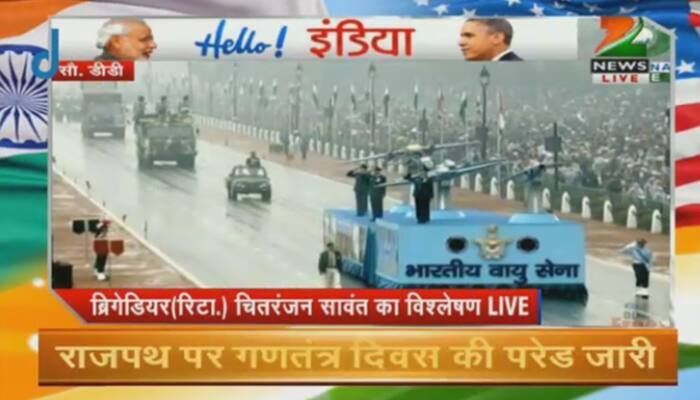 President Barack Obama is the Chief Guest for this year's parade. 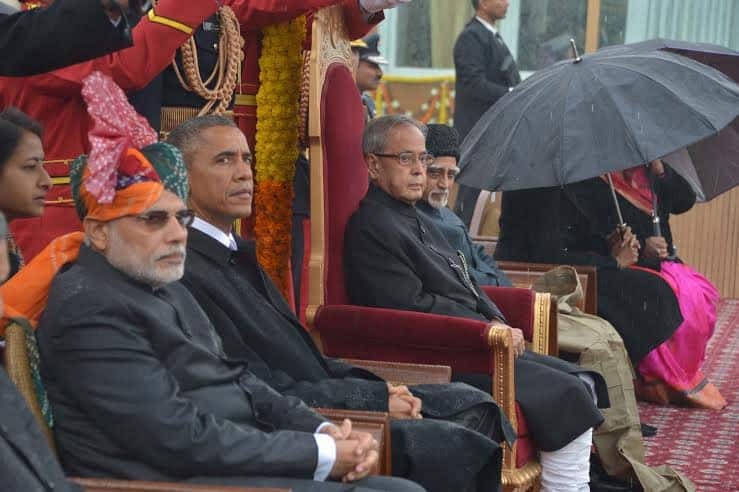 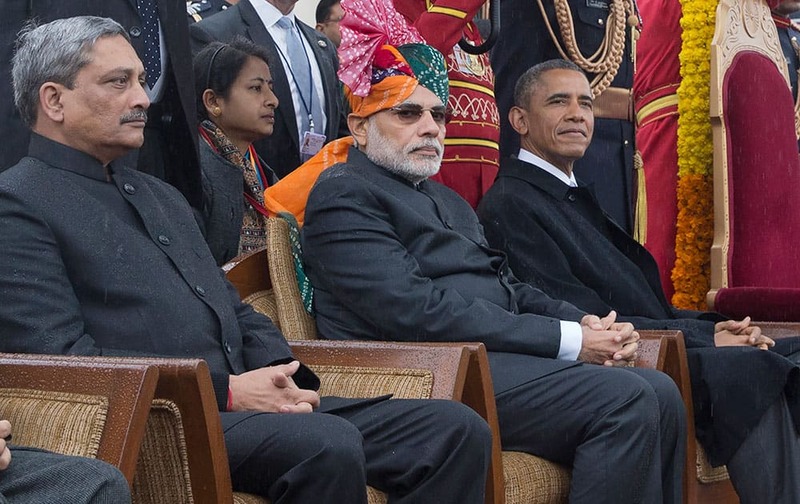 US President Barack Obama, sits with Prime Minister Narendra Modi, center, during the Republic Day parade in New Delhi. 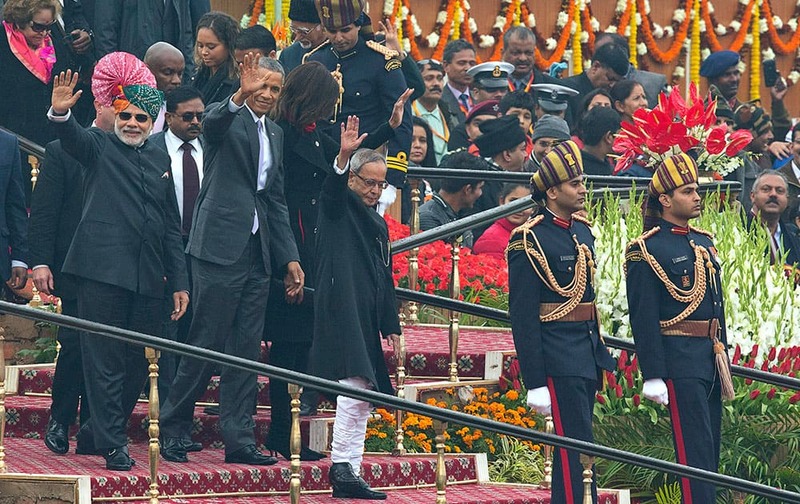 US President Barack Obama and Prime Minister Narendra Modi wave to the crowd at the end of India’s annual Republic Day parade in New Delhi. 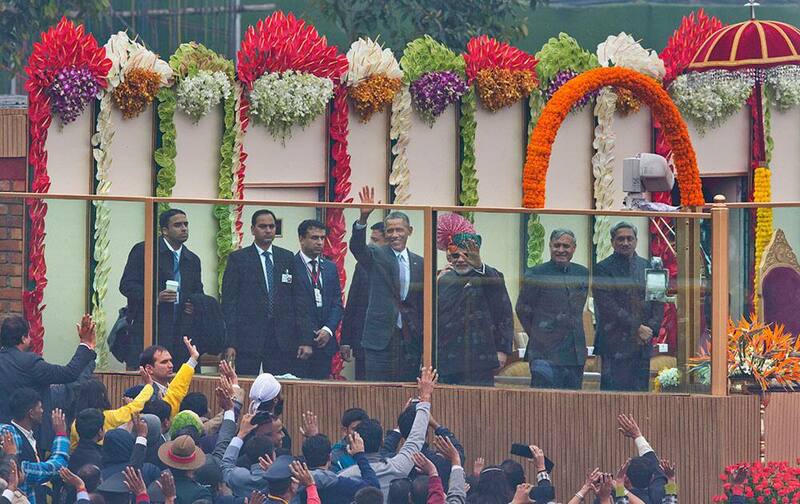 US President Barack Obama, Prime Minister Narendra Modi and President Pranab Mukherjee wave to the crowd at the end of India’s annual Republic Day parade in New Delhi. 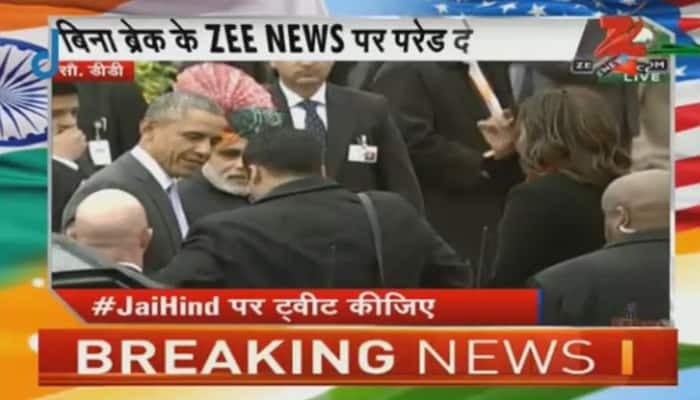 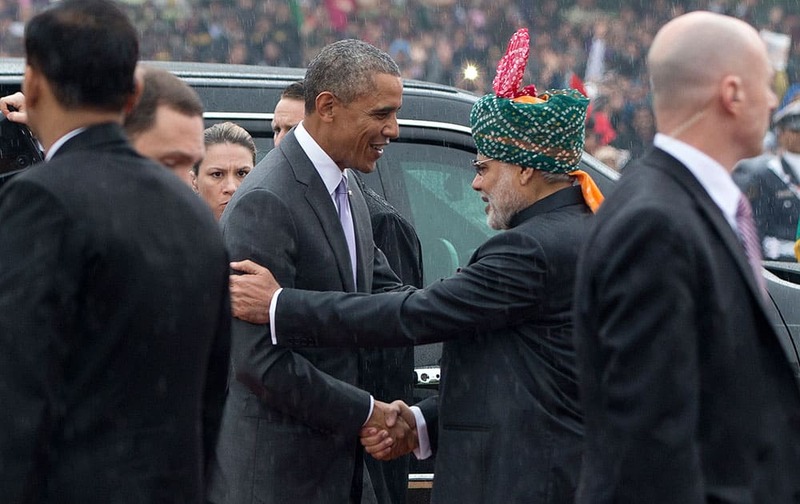 US President Barack Obama, is greeted by Prime Minister Narendra Modi as he arrives for Republic Day in New Delhi. 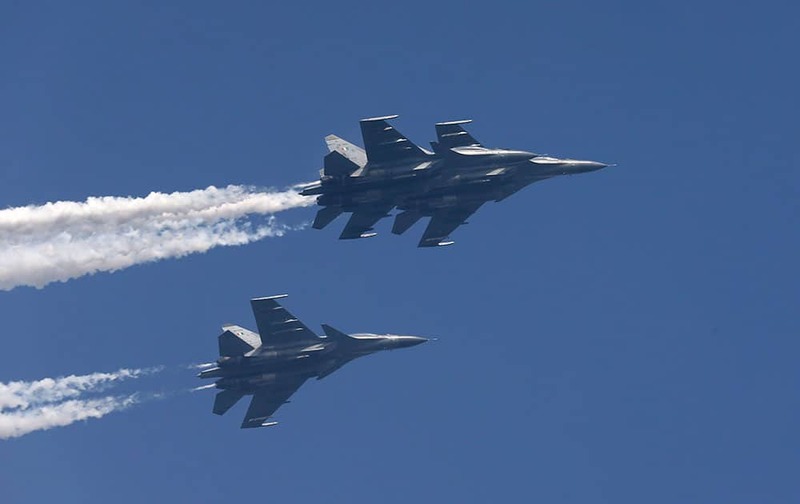 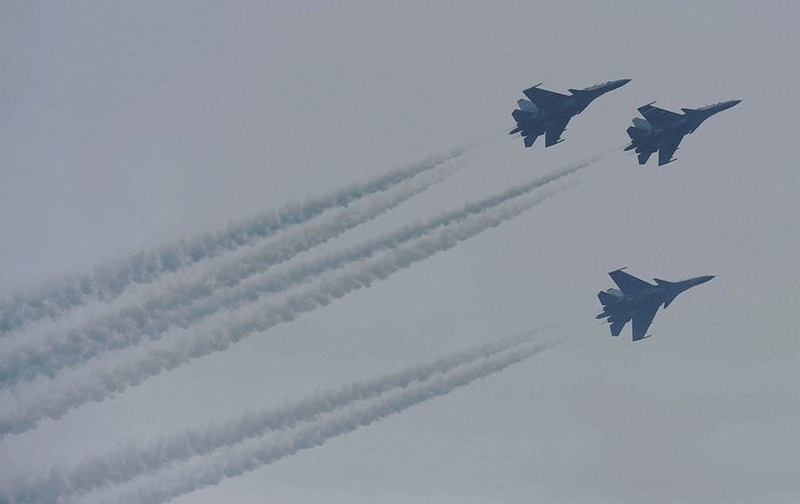 Air Force Sukhoi Su-30MKI fighters fly past during the full-dress rehearsal ahead of Republic Day parade in New Delhi. 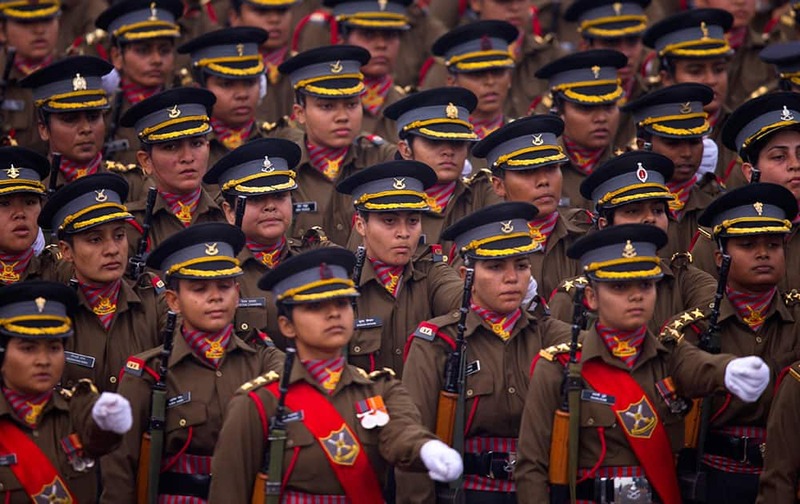 Women soldiers march down Rajpath, a ceremonial boulevard that runs from Indian President's palace to war memorial India Gate, during the full dress rehearsal ahead of Republic Day parade in New Delhi. 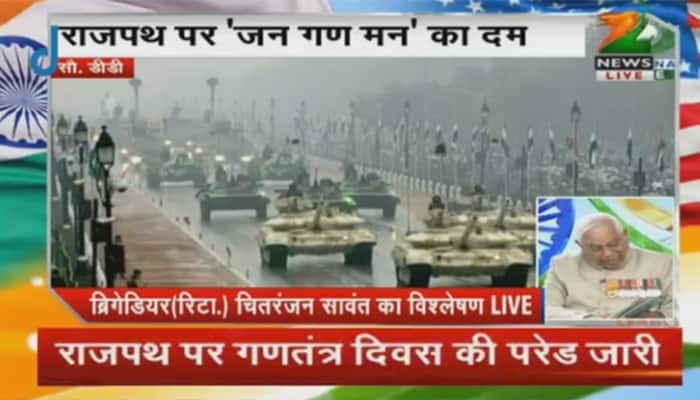 T-90 tanks roll down Rajpath, a ceremonial boulevard that runs from Indian President's palace to war memorial India Gate, as part of the full dress rehearsal ahead of Republic Day parade in New Delhi. 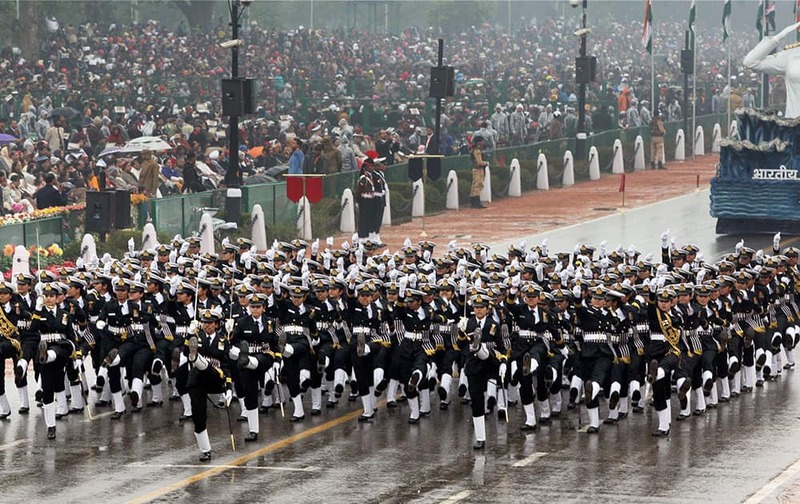 Soldiers march down Rajpath, a ceremonial boulevard that runs from Indian President's palace to war memorial India Gate, during a full dress rehearsal ahead of Republic Day parade in New Delhi. 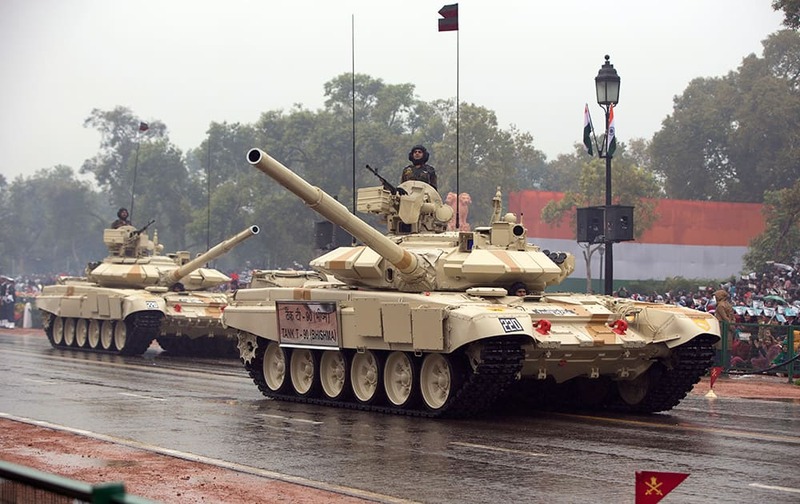 T-90 tanks roll out during a practice session ahead of Republic Day parade in New Delhi. 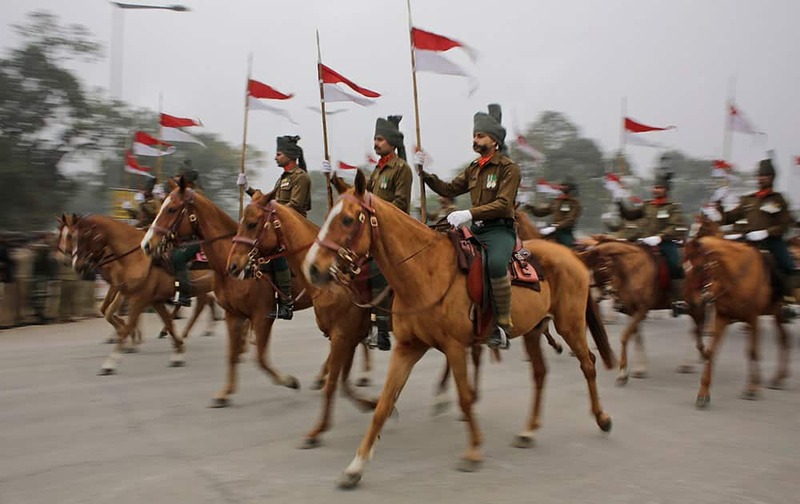 Horse mounted Indian presidential bodyguards participate in rehearsals for the upcoming Republic Day parade in New Delhi. 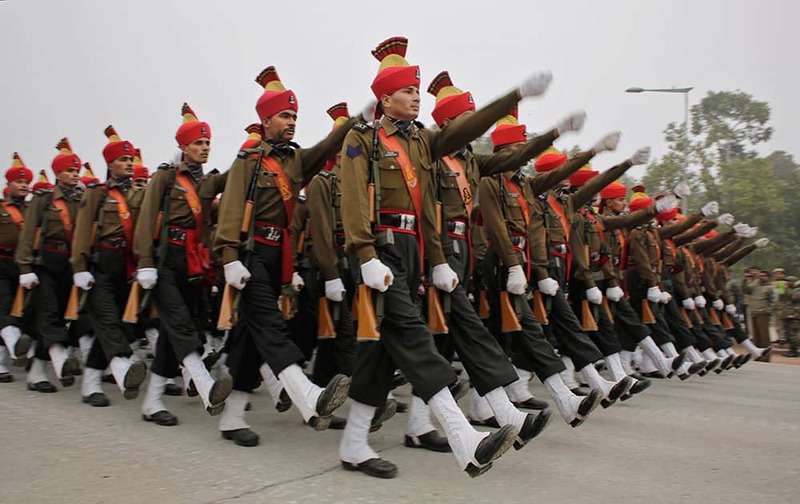 A contingent of Indian army's JAT regiment march during rehearsals for the upcoming Republic Day parade in New Delhi. 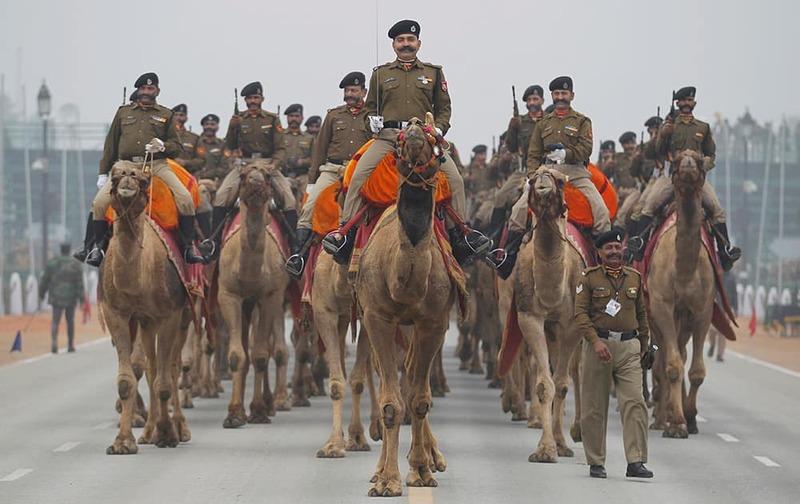 Camel mounted Indian Border Security Force soldiers ride during rehearsals for the upcoming Republic Day parade in New Delhi. 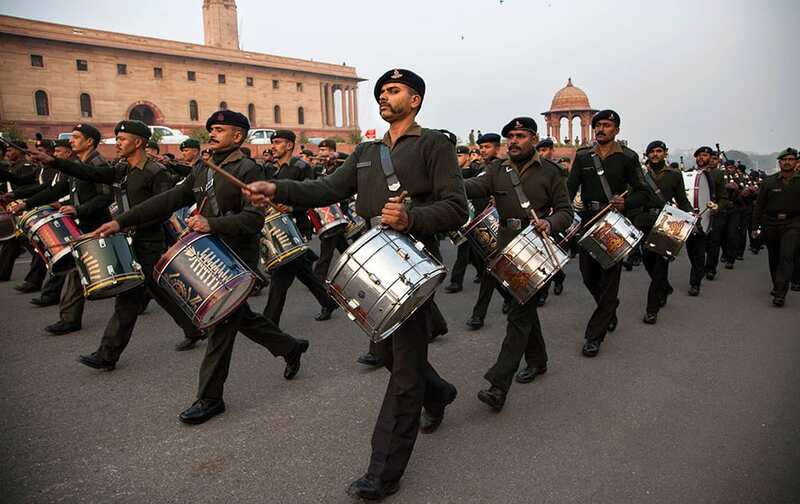 Members of the Indian Army band rehearse for the upcoming Beating Retreat ceremony at Raisina Hill, which houses India's most important ministries and the presidential palace, in New Delhi. 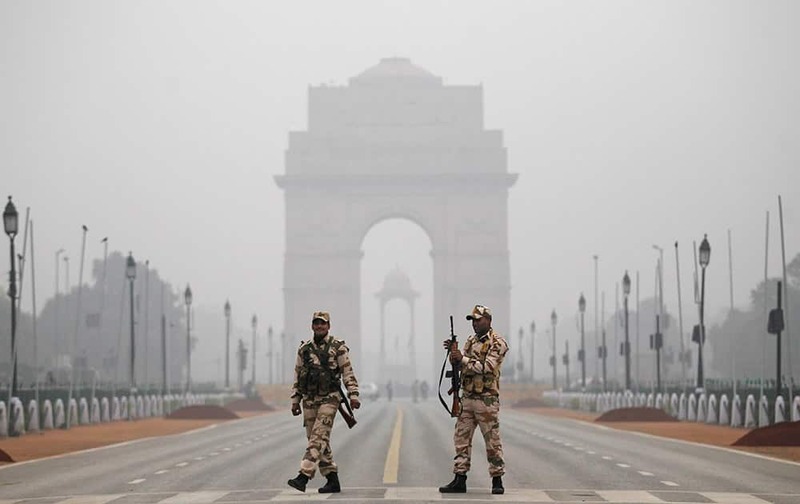 Indian paramilitary soldiers stand guard during rehearsals for the upcoming Republic Day parade in New Delhi. 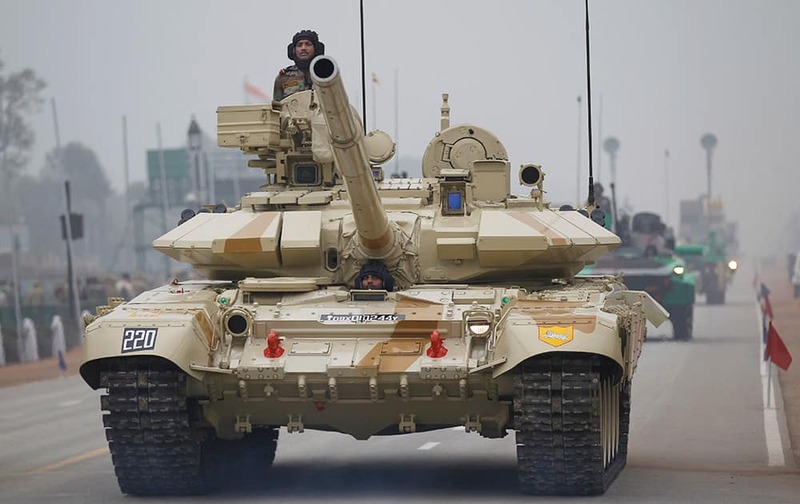 A T-90 tank rolls down Rajpath during rehearsals for the upcoming Republic Day parade in New Delhi. 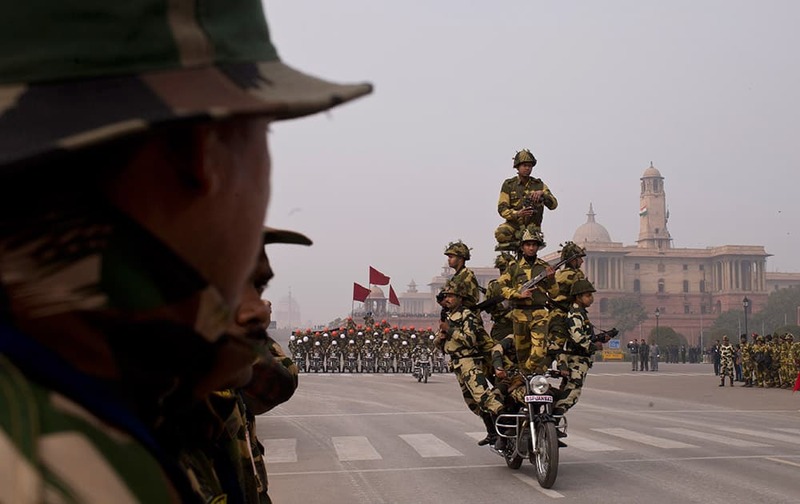 Soldiers make a formation on a motorcycle as they rehearse ahead of Republic Day parade in New Delhi. 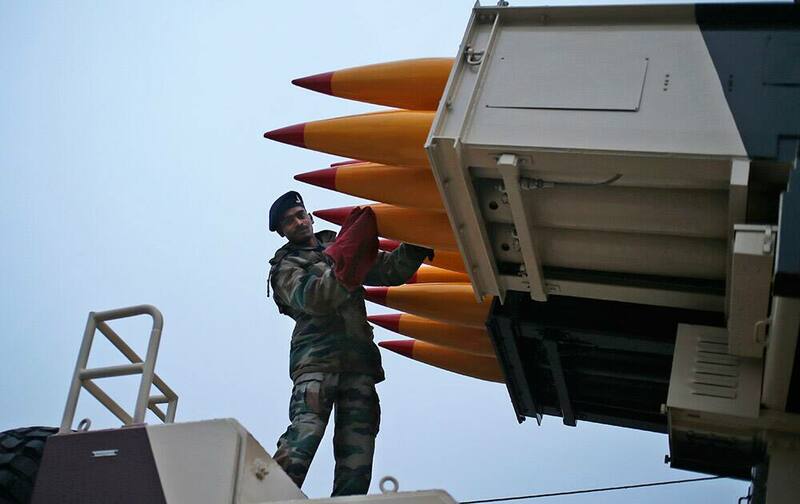 An Indian soldier cleans missiles that will form part of Republic Day parade during a practice session in New Delhi. 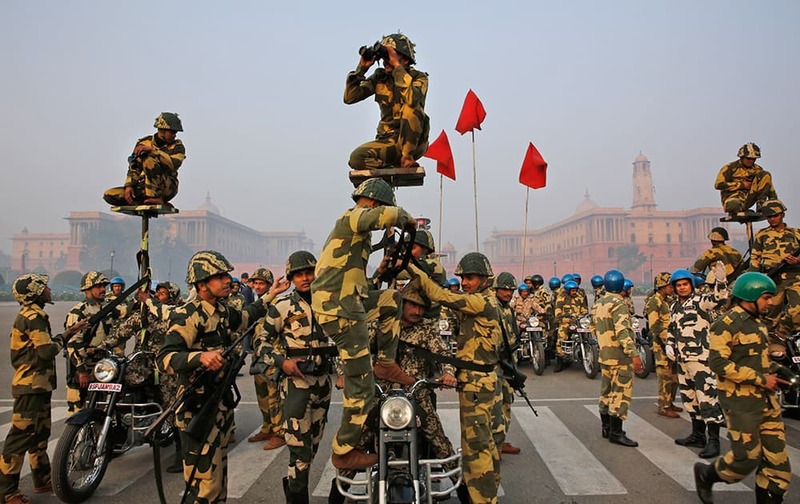 A Daredevils unit of the Indian Border Security Force prepares to perform during rehearsals for the upcoming Republic Day parade in New Delhi. 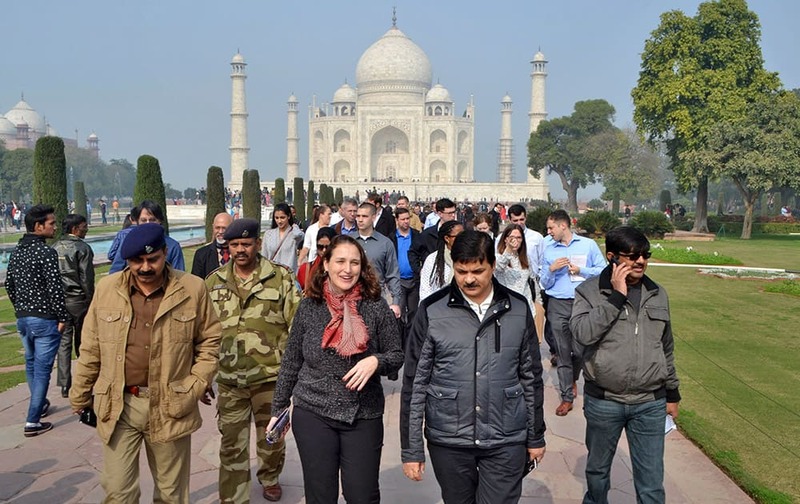 US President Barack Obama's advance team review the Taj Mahal monument with Archaelogical Survey of India (ASI) chief Navratan Kumar Pathak in Agra.